Is Financial Stress Killing Our Soldiers? Money plays a role in the alarming rate of suicide in today's armed services. I sat down withmagazine to find out more about how financial counseling might just save the lives of our soldiers, sailors, marines and airmen. I am the daughter of a military man. My father served his country for 34 years and fought in three wars. Our family moved 26 times, over three continents. I know firsthand the emotional stress experienced by military families because I lived with it. But although I often heard my parents argue about money, I didn't really understand the financial stress my dad experienced until I read a new piece of investigative journalism about the role of money -- rather, the lack of money -- in the alarming rate of suicide in today's armed services. I sat down with journalist Ann Marsh, the West Coast bureau chief of Financial Planning magazine, to find out more about how financial counseling might just save the lives of our soldiers, sailors, marines and airmen. BJG: The astounding suicide rate among active duty military as well as veterans has been in the news a lot the last few years. Many people assume it's because of PTSD and the psychic wounds of war that don't heal, driving our service members and veterans to end their suffering by suicide. But the research you've been doing indicates another powerful cause of hopelessness and despair that can lead to suicide, and that's financial stress and debt. Tell me what you're discovering. Ann Marsh: The military's own statistics show that financial strife is one of the top factors that contribute to military suicides. But the Pentagon has not studied the link between financial stress and suicide -- even though Secretary of Defense Chuck Hagel says that bringing down the high rate of military suicide is a top priority for the military. Only 13.5 percent of active duty soldiers who killed themselves in 2012 ever saw combat. More than half of them never even deployed. They were struggling with everyday life problems. It certainly is true that many soldiers and veterans who've experienced battlefield traumas, and have been injured, are driven to suicide primarily by mental distress and injuries. But the media has focused so much on these tragic cases that they've overlooked the lionshare of suicides. And in most cases, nothing so dramatic drove the suicide. It appears that everyday life problems did them in. The military does hire hundreds of financial planners to help its soldiers. But, paradoxically, it does not allow them to provide financial planning. They can only provide financial education. Most soldiers' meetings with planners last just 15 minutes. This isn't near of enough intervention, especially if a soldier is in real distress. And, to compound the problem, many financial planners aren't skilled at helping soldiers with a problem that many of them face: how to negotiate with creditors to reduce debts. The military just changed the way it's counting suicides. As of mid-April we learned that soldiers, reservists and National Guard members are killing themselves at the rate of about 1.3 a day. That's 30 percent more frequently than the military had been reporting before it started adding reservist suicides into its totals. About 22 veterans are killing themselves every day. Veterans account for more than 20 percent of all suicides in the U.S., even though they make up less than 10 percent of the adult U.S. population. These are very conservative figures. BJ: I understand that civilian men are much more likely to commit suicide than women. Is the same true for military men versus women? AM: Yes, across the board, men kill themselves much more frequently than women do. 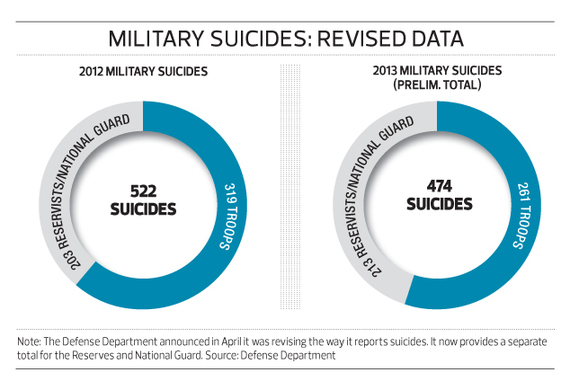 More than 92 percent of active military duty suicides in 2012 were by men. A larger percentage of women attempt, but fail to kill themselves. Nearly a quarter of suicide attempts that year were by women soldiers. The suicide rate for civilians, adjusted for comparison to the military population, is about 19 per 100,000 U.S. citizens. In 2012, 11.7 women soldiers per 100,000 killed themselves versus 24.6 male soldiers per 100,000. Are suicide rates pretty similar for all branches of the military? If not, do you have any explanation for why they're different? Historically, suicide rates have been much lower in the Air Force though those numbers have been pulling pretty close to the Navy's in recent years. One theory as to why is that in the late 1990s and early 2000s the Air Force Suicide Prevention Program was deemed particularly effective. One veteran and psychologist who worked in that program told me that, when counseling a troop in distress, he could call up a financial planner and set up a meeting for him or her right then and there. However, in the 2000s all of the military migrated much of its educational programs to computer-based models. This has reduced one-to-one human interactions and, possibly, less time for airmen with financial planners. Also, military suicides occur disproportionately among lesser-educated, lower-ranking soldiers. The Army has by far the highest suicide rates, at 22 per 100,000 in 2010 (the last year we have rates by branch of service). They also have one of the largest contingents of lesser-educated service members, who have lower incomes. This could be a contributing factor. What are the differences in suicide rates between officers and enlisted men and women? About half of the soldiers who killed themselves were junior enlisted. And 64 percent had never gone to college. Your story is about a financial planner who helped save the life of an Army Sergeant who had become suicidal. What did she do? Quite simply, she taught him how to negotiate with his creditors. It's a skill few soldiers possess, and it saved his life. He says he was two days away from committing suicide in order to get $500,000 in life insurance benefits for his family, including his two children with serious medical conditions. What kind of help and support should the military be providing our soldiers, sailors, marines and airmen? Are there any pilot programs showing how financial counseling and/or financial planning helps prevent suicide? They say the military should give soldiers more time with financial planners. Most get only 15-minute meetings with them. The military should start allowing those planners to provide financial planning - right now they are only allowed to "educate" soldiers. There should be more tactical education around negotiating with creditors. And planners need better emotional skills to understand how to deal with soldiers in financial distress, especially high debt. And, lastly, military planners say, the military shouldn't rush to label soldiers in financial distress as mentally ill. Right now, the military mainly uses psychological treatments, even when a soldier's problems may be first-and-foremost, financial. Does the military provide special low-interest loans to help service men and women buy homes, get job training to transition to civilian life, help put military kids through college, etc? There are a multitude of programs out there -- I've heard there are thousands -- designed to help soldiers and veterans. The problem is it can be very difficult for service members to find the right programs for them. This is another area in which service members and veterans need help: in directing them to the appropriate programs. In some cases, programs can provide them with grants or loans to help with car repairs or other expenses. They can also help them to keep their homes from going into foreclosures and to find job training to navigate the transition to civilian life. But one respected study by the RAND Corporationsays there's little evidence that the military's suicide prevention programs work. It points out that most of these programs don't teach soldiers the skills they need to care for themselves. Michelle Obama and Jill Biden have made military families one of their pet projects over the past five or six years. Any way to enlist their help in helping prevent military suicides? Maybe. I would hope they would want to make financial planning interventions a bigger priority for soldiers and for veterans. For more information, read "Could Financial Planners Stem the Rate of Military Suicides? "by Ann Marsh, West Coast bureau chief of "Financial Planning" magazine.